These salty-sweet finger-food treats are all the craze at football events, holiday parties, and really any other kind of gathering you could think of! 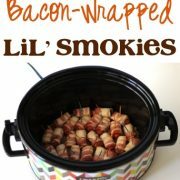 Little smokies wrapped in Indiana Kitchen bacon. Yum! 1 pkg. Little smokies 13 oz. 1 pkg. Indiana Kitchen bacon 16 oz. Cut strips of Indiana Kitchen bacon into thirds. 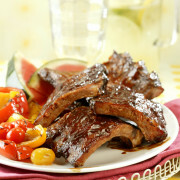 Cover smokies in crockpot by sprinkling on remaining ¾ cup brown sugar. Cook on high for approximately 3 – 3.5 hours, or until bacon is completely cooked. To make relish, drain pears, reserving juice; chop and set aside. Pour pear juice into 1-quart saucepan; stir in preserves, onion, brandy, ginger and red pepper flakes. Bring to a boil, stirring occasionally. Boil gently for 8 to 10 minutes or until liquid is reduced and slightly thickened. Remove from heat; allow mixture to cool to room temperature. Meanwhile, using a sharp knife, slice Indiana Kitchen pork tenderloin into 1/4-inch-thick medallions; place in a resealable plastic bag. 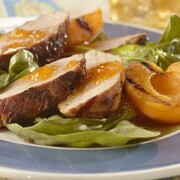 Pour about 1/2 cup cooled juice mixture over pork in bag; seal and refrigerate for at least 30 minutes. Gently stir together chopped pears, remaining juice mixture and raisins; refrigerate until serving time. When ready to cook, spray broiler pan with cooking spray and preheat broiler. Discard the marinade. Thread pork medallions onto skewers. Place pork skewers on broiler pan about 7 inches from broiler. Broil for 3 minutes per side. Serve with Brandy Pear Relish. *If apricot pieces are too large, use kitchen shears to cut into small pieces. ** Soaking wooden skewers in water helps to keep them from charring under the broiler.